The lone change sees Adnan Januzaj coming into the starting lineup to replace Ashley Young and he will link up with Juan Mata and Memphis Depay in supporting striker and captain Wayne Rooney in the attack. Januzaj, who makes his first start since early February, has been positioned on the left, but the Belgian could very well move inside to play in the No. 10 slot behind Rooney, with Depay moving outside on the left to deliver his crosses. “He showed a lot of good things in training and I will play him in his favourite position in no.10,” United manager Louis van Gaal said. Meanwhile, with David de Gea still out of the squad after not selected by manager Louis van Gaal, summer signing Sergio Romero, who was impressive in the latter stages of the opener against Tottenham, will continue to start in the goal. Chris Smalling and Daley Blind are again trusted as the centre-backs, with Morgan Schneiderlin and Michael Carrick leading things in the central part of the midfield. For Aston Villa, Tim Sherwood will continue with his setup that defeated the newly promoted Bournemouth 1-0 over the weekend, which means striker Rudy Gestede, who scored the winning goal after coming on as a second-half substitute, remains on the bench. Idrissa Gueye, Jordan Ayew, Gabriel Agbonlahor and Scott Sinclair all start for Sherwood’s side, which will try to go top of the Premier League standings with a win. New recruit Adama Traore will be in attendance for The Villans, but the Barcelona loanee who just put pen to paper, will not be in action. It could be a difficult night again for Aston Villa as they face a striker in Rooney, who has scored more goals against them than any other team, while the hosts haven’t beaten Manchester United at home since 1996. A win tonight for Man United, who defeated Tottenham 1-0 in their opening game of the season, would see them going three points clear of the top of the EPL table standings. 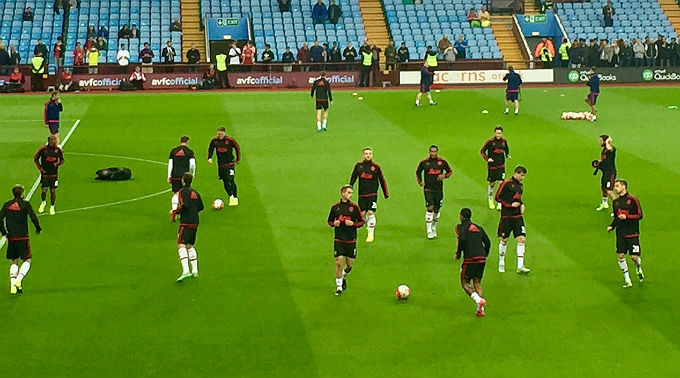 Also on the bench tonight for van Gaal’s side are Javier Hernandez, Ander Herrera, Antonio Valencia and Bastian Schweinsteiger.